The TiEGr Cairo Satellite Centre is run in collaboration with our delivery partner the Arab British Academy for Training and Human Resources and Development (ABAHRD) offering a range of UK regulated Early Years qualifications. TiEGr is delighted to be working in collaboration with the Arab British Academy for Training and Human Resources Development (ABAHRD) a respected and well-established company registered in both Egypt and the UK. ABAHRDs’ expertise within the education and training sector and their focus on quality and customer service makes them the ideal delivery partner for TiEGr, reflecting our company ethos and mission to raise standards within the international early years sector. ABAHRD is licensed by the Central Agency for Organisation and Administration (CAOA) No 316801. Individual units can also be studied with ABAHRD and certificated as stand-alone units for continuing professional development (CPD) purposes. For more information about qualifications please click on the link below. 32 Esraa El- Moalmeen st, Lebanon Square- EL-Mohandseen- Giza, Cairo, Egypt. NCFE/CACHE is a UK Government regulated awarding organisation. CACHE qualifications are written by leading industry experts and based upon UK National Occupational Standards (NOS) and the Government Early Years Foundation Stage (EYFS). 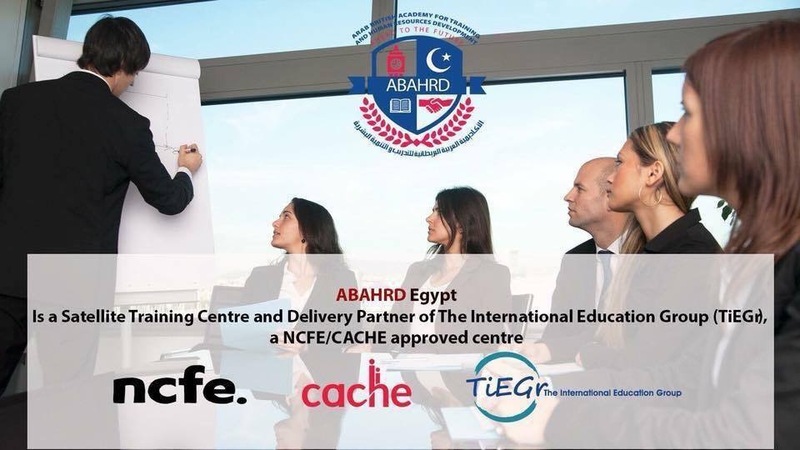 ABAHRD is a Satellite Centre and delivery partner of The International Education Group (TiEGr) a NCFE/CACHE approved centre. The International Education Group (TiEGr) working with the Arab British Academy for Training and Human Resources Development (ABAHRD) to support the Egypt 2030 vision for education and training.